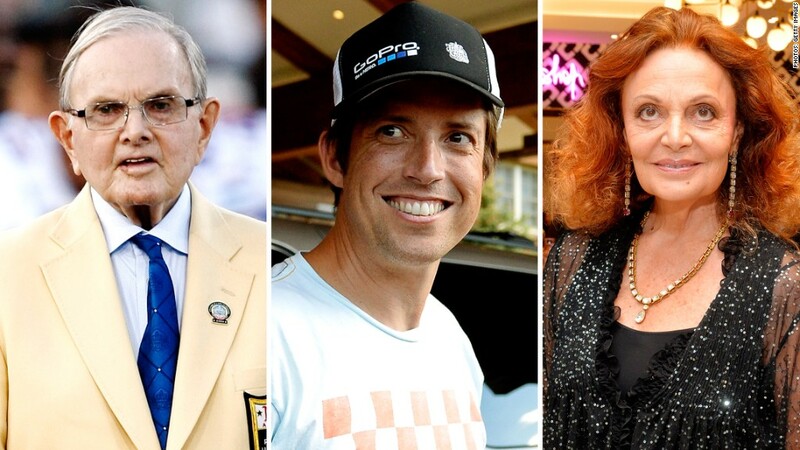 Ralph Wilson, Jr., (left) Nicholas Woodman (middle) and Diane von Furstenberg gave away a lot of money this year. The top donation to charity this year came from a man who made his fortune back when Mark Zuckerberg was just a glimmer in his father's eye. Ralph Wilson, Jr., the billionaire owner of the Buffalo Bills football team, gave the largest individual donation of the year, according to a ranking from the Chronicle of Philanthropy. A manufacturing magnate, Wilson passed away at the age of 95 in March and left $1 billion to his family foundation, which works to help homeless and poor families in Buffalo and Detroit. Last year's top donation of $990 million came from Zuckerberg, the 30-year old founder of Facebook (FB). This year's second largest gift year came from Ted Stanley, an 83-year old Connecticut billionaire, who pledged $650 million to support research in mental health. Stanley, who made his fortune selling sports memorabilia and other collectables, has a personal connection to the cause. He told The New York Times that his son, Jonathan, has a bipolar disorder and that medication saved his life. While the top two donations came from old-school billionaires, the third came from a 39-year old surfer dude billionaire. Nicholas Woodman, founder of the body-mounted camera company GoPro, gave $500 million to the Silicon Valley Community Foundation, which makes grants to a variety of causes such as education and immigration. Woodman took his company public in June, making him a billionaire three times over. His largess caused a stir on Wall Street when Woodman decided to donate 5.8 million of his shares to his family foundation even before the stock was available to traders. Another tech billionaire, Google (GOOG) cofounder Larry Page, 41, made the fifth largest donation of the year. Page gave $177 million in stock to a charity he set up in the name of his father. "Young tech wealth is continuing to give," said Stacy Palmer, editor of The Chronicle of Philanthropy. She said the giving had reached a high point last year with Zuckerberg's big donation also to the Silicon Valley Community Foundation. Meanwhile, the fourth largest donation of the year went to Harvard University. The Morningside Foundation, run by the family of Hong Kong real estate tycoon T.H. Chan, pledged $350 million to the Ivy League university's School of Public Health. It was the largest gift in Harvard's history. Gerald Chan, one of the T.H. Chan's sons, earned a master's degree from the School of Public Health in the 1970s. Another notable bequest came from media mogul Barry Diller and his fashion designer wife, Diane von Furstenberg. 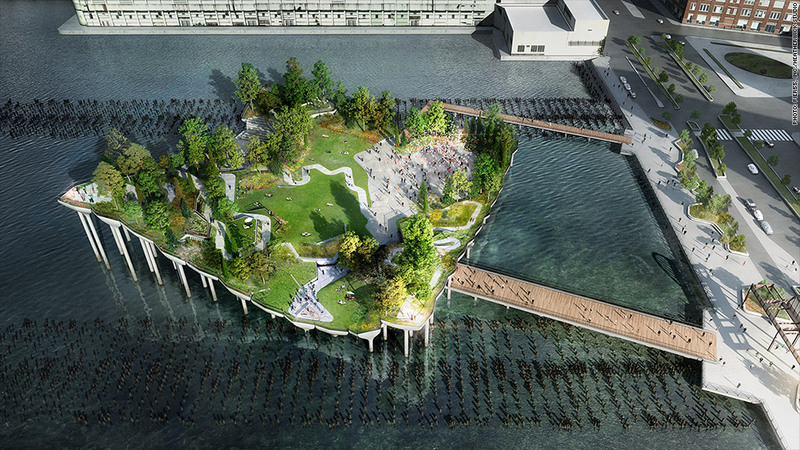 They pledged $130 million to help build a floating park in New York City's west side (pictured below). The Diller-von Furstenburg Family Foundation has made dozens of grants to promote art and education in New York City. It was the seventh largest donation of the year. Palmer said it's unusual to see such a large donation go to a public park, since most big grants fund scientific research or social causes. Overall, the 10 biggest gifts totaled $3.3 billion, down slightly from 2013. "It's not as strong as you might expect given where the economy is," said Palmer. But the total is still up significantly in the years following the financial crisis, when the tally averaged about $2.5 billion. "Clearly, donors are ready to give," she concluded.